As the hardreading staff noted earlier today, Digital First Media – the hedge-fund-fueled conglomerate that strips newspapers like cars left overnight on the Cross Bronx Expressway – has stepped up its news sharing among the chain’s Massachusetts dailies. 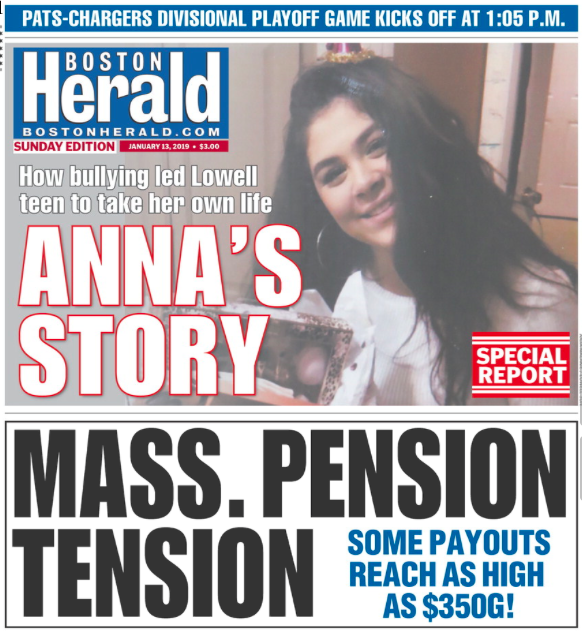 Yesterday it was Lowell Sun reporter Rick Sobey’s heart-rending front-page story of Anna Aslanian’s taking her own life to escape bullying. That piece wound up on Page One of the Boston Herald as well. Today the papers criss-crossed: Herald reporter Alexi Cohan’s Special Report on bullying and the nine-year anniversary of South Hadley High student Phoebe Prince’s suicide migrated from the splicey local tabloid to the Sun’s front page. Cohan’s reporting also appeared in Fitchburg’s Sentinel & Enterprise, another DFM kissin’ cousin. Given Digital First Media’s neutron bombing of its newsrooms and recent consolidation of its “Northeast Cluster” under a Regional Editor in Chief, it’s fair to assume that we’ll be seeing a lot more of this carbon copycatting in the future. Not sure, however, that we’ll keep our subscription to the Eastern Massachusetts Herald-Sun-Sentinel. Last month Digital Worst – sorry, First – Media, the hedge-fund-fueled conglomerate that strips newspapers like cars left overnight on the Cross Bronx Expressway, made this announcement. Boston Herald Editor in Chief Joe Sciacca has been named to oversee the editorial operations of seven daily newspapers in Digital First Media’s Northeast Cluster, the media company announced today. As Regional Editor in Chief, Sciacca will oversee DFM’s papers in Massachusetts and New York. Those papers include the Boston Herald; The Lowell Sun; Sentinel & Enterprise of Fitchburg; the Daily Freeman in Kingston, The Record of Troy, The Saratogian of Saratoga Springs and Oneida Daily Dispatch. 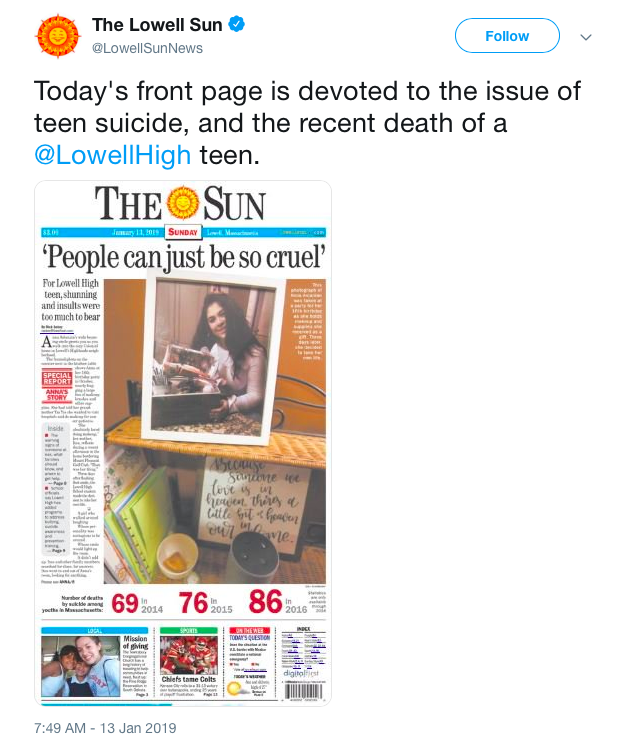 Cue the Lowell Sun’s front page yesterday, which featured the heart-rending story of Anna Aslanian’s taking her own life to escape bullying. Then cut to the splicey local tabloid’s Page One piggyback on that same story. Sort of a cluster buck, no?